Home Latest Blog Affordable Jewish Education – Where ? Affordable Jewish Education – Where ? Australia has a Jewish education system, considered by some to be world class and held in very high esteem. Combining secular studies with Jewish learning, and catering to every spectrum of religious observance or thought, it is hard to argue the importance of our Jewish educational institutions, specifically the Jewish dayschool movement. These results have come at a price, and while the price was worth it at inception, when the level of education was more affordable, the situation at the coalface is now very different. 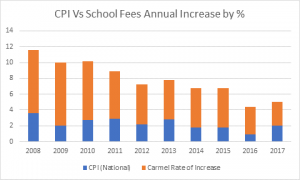 Carmel School fees have increased 57% over a 10 year period. I am sure there is some kind of justification, why fee paying parents, need to pay 57% higher costs for education over a 10 year period. Whatever the justification it is irrelevant. We have entered an age where there is little wage growth and low inflation. A situation not destined to change anytime soon, unfortunately. Generation X, the largest fee paying group at Carmel School, are now the first generation in Australian history more likely to have gone backwards in wealth generation compared to their parents. In layman’s terms when you die, you will have less to pass onto your children and family. The system has majors cracks, there exists no leadership in Sydney, Melbourne or Perth who will discuss any other option, other than the status quo, despite being warned repeatedly over the past 10-20 years that in the future, Jewish dayschool education will only be an option for the rich and the poor. The rich will have the money to pay regardless of the amount and the poor would potentially be eligible for subsidy’s from The JCA or another funding mechanism such as the Seeligson Trust in Perth. No real funding mechanism exists, to assist those hard working families shouldering the burden in the middle. Middle class families do not show on the radar, because they never considered Private Jewish dayschool education as an option in the first place because of the financial burden. As people leave the system the school has no real choice, but to raise fees because, reducing cost structures in schools is very challenging. Certain subjects have to be provided, to comply with federal and state regulations. Cutting subject choices, turns potential fee paying parents off, because the perception is the product is not as good as other competing schools. School buildings are built with a 25-50 year plan to accommodate a certain number of students, if the enrollment numbers decrease, the building remains and has to be maintained regardless. In the increasing fees scenario, the burden increases on non subsidised families who would also have a financial breaking point, after which they look at alternative options. Those families receiving a subsidy would draw more from the already pressured and finite funding systems, so the impact on the community becomes greater as less funds exist to subsidise other important areas of education, welfare etc. Other factors affecting the number of students for potential enrollment are a declining birth rate in Australia, low wage growth since the GFC in 2008, an increasing tax burden to fund politicians lifestyle choices and debt binges, coupled with much higher rates for utilities. Less children to educate and less money to spend on education. Currently in Sydney and Melbourne there are a number of public schools that are almost 100% filled with Jewish kids and have introduced a more in depth Hebrew/Jewish studies curriculum. It is certainly not of the same standard of a private Jewish dayschool, but its free. Many families over East have only one choice now, and that is to purchase an overpriced 2-3 bedroom unit and somehow survive. Private dayschool is not an option unless funded externally i.e grandparents, Jewish Welfare, JCA etc. The generation of grandparents funding school fees is almost finished and there are real questions over how long welfare subsidies can provide for the next generation. The money has to come from somewhere. What next ? I hope as a community we can engage in proper debate, and discuss the options. It is not reasonable for the school to continually increase costs above inflation and expect the full fee paying parents to shoulder the burden. This is a shared responsibility for the school community and it is time all aspects are investigated, starting with teachers salaries, fee subsidy misrepresentation, general wastage, educational programmes that cater to the few and not the many. What is the likelihood of the school committing to a CPI capped fee regime ? Are we willing to accept that with such a restriction some programmes are cut and not available to our children ? Hope you had a good break, $42000 in school fees for 2 children is only $3818 per month. Oi Vey !!! Dovi Hamelech. If you take your $42,000 and add $10,000 for extra curricular costs such as uniform and stationary ($5,000 per child), then it is costing you $1,000 a week of after tax income to have your two children at school. Some people have larger families and shoulder an even bigger burden. The problem is that this is not the number one critical concern and issue of the Australian Jewish community. We are more concerned with issues relating to social policy, we are more committed to philanthropic contributions to Israel organisations, and the cost/availability of Jewish education is not a community crusade. This is not an issue for Carmel School alone. It is an issue for the community. I think that the management and administration of the Carmel School budget is remarkably well done, and necessary for the financial sustainability of the school. However the cost inflation is real and has a cumulative impact. It is also reflective of a general economic shift (the same inflators relate to aged care, government services, utilities etc etc). So highlighting this post should not be in the context of criticising the school, but rather emphasisng the impact of the longer term paradigm shift and our need to address a critical response for the sake of the future of Jewish day school education. Hopefully your post will draw some discussion on this matter. I understand your concerns about the costs of private Jewish education in Australia as well as the costs of living in Perth and Australia overall. What I don’t understand is where you mention the link between overall wealth generation and costs of private school education. Private education is always far more expensive than the public school system which we have quite a good one compared to other places. There are plenty of ways to create wealth. I disagree with your comments that the middle class can’t afford Jewish school education; I’m proof of this. My family lived in Sydney at the time and I was educated at Moriah College for four years. From a parents’ point of view, the assessment needs to be made; is the cost of education worth it. What your views on this are, of course are up to you. There are plenty of examples of Jewish people in Perth who completed high school studies at a public school and were quite successful in completing their studies, finishing a degree and going on to productive work careers. I sincerely believe that if someone wanted to succeed, they could do it in any environment. This I think is where the focus should be. ‘Middle class families do not show on the radar, because they never considered Private Jewish dayschool education as an option in the first place because of the financial burden’. With respect, I think this is wrong. The middle class families are the ‘sandwich class’ and we form the majority of school fee payers. We make do. We sacrifice so that our children can get an excellent Jewish and secular education. We don’t go on holidays, we convert our mortgages into interest only payments, we keep our cars until they fall apart and the idea of a big night out is staying at home and watching the Bachelor. The bottom line is that I’m prepared to have a cheap haircut so that my boys can have wonderful educations. Yes, the fees are high and yes, we struggle, but our children will always be first priority. Thank you for raising this important issue for discussion within our community. You raise some valid points, as do those who have commented subsequently. As a School, we understand the challenges facing parents within the context of providing a rich and fulfilling education for their family. From our perspective, the School holds paramount our responsibility of the education of future generations of Jewish families and we strive to do this within an academically rigorous environment and in partnership with parents. Our Board and leadership spend considerable time balancing the often competing demands of maintaining a high standard educational environment, and making the Jewish educational experience a possibility for all Jewish families who seek it out. I welcome you to continue the discussion on this topic, by contacting me at the School to set up a time to meet.